Check out this unusually designed webcam, branded GE but made by Jasco. Introduced last year, it can either be clipped to your laptop screen or stood up on its pedestal that collapses into a smaller lens-protecting package to take on the road. It is also four LEDs surrounding the lens, bringing out the twinkle in your eye, or maybe even smoothing out a wrinkle or two. Yeah, this is a cheap webcam that sells for $31.95, but it still packs nominal specs such a 640x480 resolution, a built-in mic and 30fps video. They've been spotted with either a black or white finish. 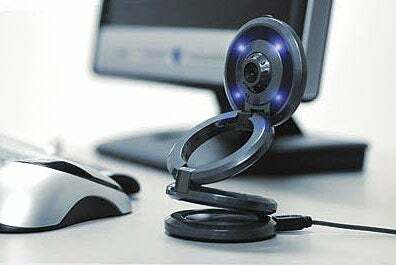 Might be a nice addition to your travel kit if your laptop doesn't already have a built-in webcam.